The 2019 Ford Figo is likely to undergo just a mid-cycle refresh with some exterior styling and interior updates; may borrow engine and transmission options from the Figo Aspire sedan. 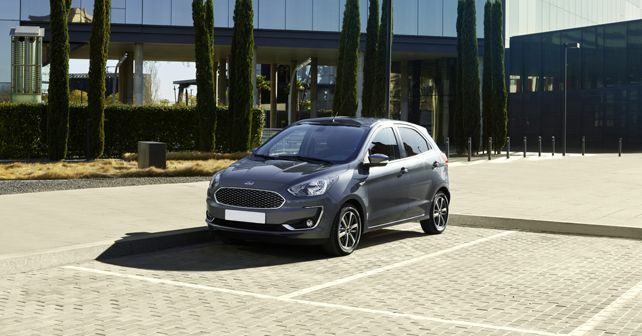 Ford has revealed that the 2019 Figo, a face-lift of the current model, will be launched here on April 15th. As part of a mid-cycle refresh, expect the new Figo to sport some styling tweaks along with new powertrain options, most likely borrowed from the Figo Aspire sedan. Going by the international-spec model, expected styling upgrades include a revised bumper design, a new honeycomb grille replacing the current horizontal multi-slat unit and chunky chrome surrounds for the fog lamp units. In essence, the styling will be more or less similar to the current Figo Aspire. Further, the headlights and alloy wheels too are expected to be replaced with more modern-looking counterparts. Inside, Ford's Sync3 infotainment system might join the features list although, we reckon that might be something on offer at the higher end of the variant spectrum. Apple CarPlay and Android Auto connectivity are also likely to be introduced. The Figo Aspire was launched, not too long ago, with two new petrol engines: A 1.2-litre three-cylinder Dragon series motor (first seen on the Freestyle) and a larger, 1.5-litre Dragon series motor (from the EcoSport). These same engine options are likely to be offered with the new Figo hatchback as well. As for the diesel derivative, the old 1.5-litre engine is likely to soldier on. In terms of pricing, we expect the new Figo to have a lower price tag than the outgoing model if the recent launches of the new Endeavour and the Figo Aspire are to go by.